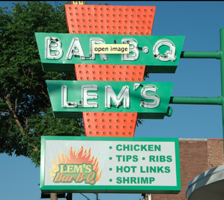 Lem's, the famous Bar-B-Q House, is known for its rib tips and hot links. In 1954, two brothers, Bruce and Myles Lemons had a dream. A dream for their future, a dream of hope, a dream of destiny... It was a dream of entrepreneurship. With this dream, they opened their first store on the south side of Chicago. Myles, a formal chef created Lem's original Bar-B-Q sauce and its magical spices. Once people had a taste of the secret sauce, they kept coming back for that unique flavor. And as a result, Lem's Bar-B-Q House was a success! After fourteen successful years the company decided to open another location. Myles and Bruce idea of having a second location;included their brother James, also a formal chef. In 1968, the second Lem's Bar-B-Q House opened in the historic Chatham Neighborhood. Lem's, the famous Bar-B-Q House, is known for its rib tips and hot links. Lem's Bar-B-Q House was a success! in the historic Chatham Neighborhood. "Oh man these rib tips are amazing."